Most people who read this blog know we are in a period of transition–again! The paid part of Mark’s pastoral position at Providence (a lot of aliteration) ended in December, so we are waiting to see what the Lord has for us. I thought some of you might like a little update on what’s happening with us right now. We are doing ok. Mark has been working part-time doing some computer/administrative consulting for a salesman. This is the salesman’s slow time, so that work has been cut back. It sounds like he’ll be calling on Mark again when business picks up. In the mean time, Mark has picked up a 2-month writing project that will keep us afloat for a while. He is also doing some pulpit supply which is helpful both for keeping his preaching skills in practice and for some extra income. I am just busy. I started a new part-time job at the beginning of January as a secretary in an insurance adjuster’s office. The office is 5 minutes from our house, and I only work three days a week during school hours. I like the actual work itself. However, the business isn’t the most stable financially; but so far, they haven’t gone under. But the location and the hours are good. So I’ll keep at it for now. If I could just get the laundry caught up and the house cleaned once, I might be able to get in a good routine to keep it all up. The children are all doing well at school. Calvin continues to meet with bumps in the road, but he is navigating them with effort. Evangeline is so much happier at school this year. She has improved in some important areas, and she needs work in some others. But I am really pleased with her attitude and enthusiasm for life. Nevin is doing very well in school, and his basketball team is doing pretty well, too. Charis is just Charis–busy, having fun, doing her thing. She prayed at devotions last night for our friends, and she mentioned each of them by name and that she loves them. This was really sweet. She goes to their house on Friday and plays with the younger kids, so she is getting close to them. We are really thankful for things right now. At the end of 2006, we were feeling a sense of doom much of the time. I was crying every time someone asked me how we were. So far in 2007, God is showing us that He will meet our needs. We are grateful for His provision, and we are looking forward to the plans He has for us for the future. Yea! We got an A! Here’s something that I have been thinking a lot about lately. My last entry was on December 19. A Tuesday. It wasn’t a great day for me since I scraped a car in the pre-school parking lot. The next day, Dec 20, was Mark’s and my 15th wedding anniversary. Thanks to a friend, we were able to go out for a nice dinner followed by an exciting stroll through the aisles of the grocery store. Hey, it’s great to be celebrating 15 years of marriage, but after that long, just being somewhere–anywhere–together without the kids is about as much excitement as we could handle. We were home by 10 pm. 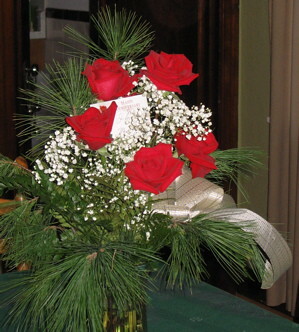 They resemble the bouquet I carried for our wedding, and they were my favorite Christmas decoration of the year. We had family visit us over the holidays. Mark’s parents, his brother, sister-in-law, and 4 children arrived at our house on Christmas Day night. Mark’s brother and family stayed with their good friends who also live in St Louis, so we just had a houseful for several days of that week between Christmas and New Year’s. We enjoyed having everyone here, and it was great for the kids to spend time with their cousins. Here’s a shot of all the cousins after church on New Year’s Eve day. As you can see, we ate at O’Charleys, where kids eat free. We certainly got our money’s worth that day! I hope they don’t mind the free advertisement here. So 2 days after the company left, the kids went back to school, and I started a new part-time job. I’ll post more about that later. Two days after that, we packed up the kids and went to Chicago for Mark to do pulpit supply at a church up there. We enjoyed a day with some new friends at the Field Museum there, and, it was a relaxing weekend for us. Then we got home late Sunday evening; I’ve worked every day this week, and the kids have had stuff going on every day after school. So FRESH is NOT the word I would use for our house. I hope to change that this weekend in between scouts and basketball games. So I am FINISHED for now. Happy New Year! !